November is such a good month. The weather is warming up, the jacarandas are filling the sky with purple haze, and much-loved West End watering hole Lock'n'Load is giving away a sweet bike. Wait, what? A whole bike? Yep, you heard right, the whole gosh-darn thing. Thanks to the magic of Instagram (and Monteiths Cider) you could be cruising around the streets of Brisbane on a brand new, spiffy green, retro-style cruiser. All you have to do, dear reader, is snap a picture of yourself enjoying one of Monteiths' special cider towers, like the one pictured below, hashtag it with #urbanlisted and #lnlbistro or #poweroftower, and post that baby straight up. Don't worry if you haven't entered the Instagram fray (we understand, it is a scary world), you can still participate without using and new-fangled modern technology. Lock'n'Load have kindly provided an old school option, with paper forms also available (just ask the friendly bar staff). And now for our safety message, kids: While the cider towers are pretty amazing—shared between friends of course—you will definitely need to line those bellies with some good food. 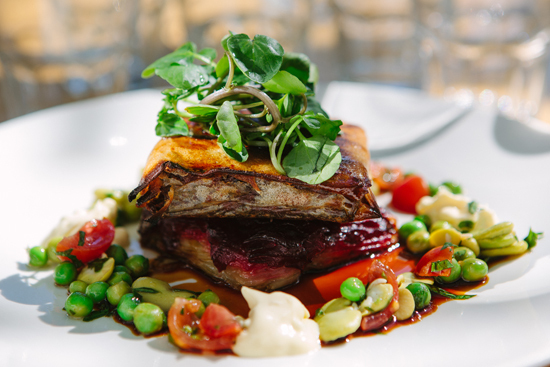 Luckily, Lock'n'Load has just released their new spring menu full to the brim with tasty delights such as the Cheeky Wellington, which is a delicious mélange of sticky beef cheek pastilla with beetroot gratin, pea salsa and horseradish foam. Or how about the Five Spice Roasted Duck Leg with chestnut purée, black cherry relish & balsamic jus…Jus' saying. And if beer's not really your tipple of choice, they also have a stellar new wine list. The competition runs for the whole month of November, with the winner will be announced on Sunday, 1 December, so head down to Lock'n'Load now, and get in it to win it! (click here for all the comp's details).